Wear guides are wear-resistant, resilient, thermoplastic bearings that go inside hydraulic applications, guiding, supporting or reducing friction between the cylinder body and rod. They are particularly important when heavy side loadings cannot be avoided. 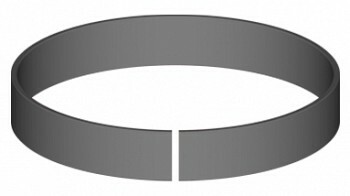 As an example, over time a heavy side loading may result in normal rod bearings becoming oval shaped. The misshapen rod bearing may then suffer poor seal performance since the clearance between the rod seal and shaft becomes larger with wear. The distortion can lead to excessive leakage of fluid, rod seal deformation, seal extrusion and ultimately, seal blowout.